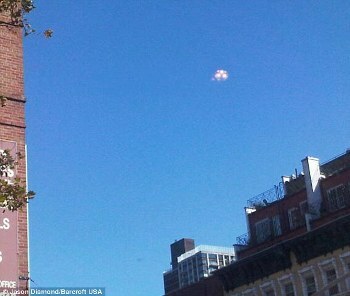 On October 13, several dozen UFOs were sighted over New York City. The sightings began around midday and lasted until early evening. They were sighted by hundreds, and filmed by witnesses and television crews. Multiple videos of the UFOs have been broadcast. There was no official comment from government authorities over the source of the UFOs that maintained a steady position for hours on end. The FAA said nothing showed up on radar and it had no advance reports of balloons being launched in the area. The October 13 sighting would be like so many other unexplained UFO sightings over major cities, except for one notable exception. Stanley A. Fulham, a retired NORAD officer, actually predicted October 13 as the date that extraterrestrial visitors would appear as the initial step in a process to educate the world public that we are not alone. Astonishingly, his prediction was validated by the mass UFO sighting in New York, as well as in other major cities. Could the New York UFO sighting on October 13 be the first step in extraterrestrials indisputably revealing themselves to the world public as Fulham claims? Fulham first made his prediction in a Youtube video (below) posted on June 26, 2010. The aliens’ UFO display on 13 October 2010 is a tentative date. The aliens function with their Free Will and Choice and may determine that the conditions on Earth are so bad with the earth changes and the world’s economic and financial collapse that their intervention at that critical time would collapse humanity in massive panic, fear and confusion. If so, it will only be a temporary postponement of their intervention because their UFO display is only the initial step in preparing people for their intervention, possibly in 2015, without creating massive fear and panic. There has been a succession of past predictions concerning UFOs showing up on specific dates to demonstrate the reality of extraterrestrials visiting our world. One of the most prominent was an Australian psychic, Blossum Goodchild, who predicted October 14, 2008 as the date that UFOs would show up. Given the dismal track record of prior UFO predictions demonstrating the existence of extraterrestrial life, this writer like many others, did not get too excited by Fulham’s October 13 prediction. Furthermore, when it became clear that Fulham’s prediction derived in part from the alleged channeling of extraterrestrials he calls the “Transcendors”, that made it even less appealing. The spectacular October 13 sighting of up to several dozen UFOs over New York city, as well as independent UFOs sightings in San Francisco, Seattle, Orlando, Puerto Rico, and Malaysia is partial vindication for Fulham’s prediction. “the aliens will neither land nor communicate on that date,” the consequences of the mass UFO sightings are not what Fulham predicted in his Press Release. However, what was sighted and filmed in New York was hardly indisputable proof of extraterrestrial life. The objects were distant lights that held a steady position for hours on end. This would rule out the idea that they were helium party balloons as claimed by students from one school in nearby Mt Vernon. The opinion of many observers was that the objects were not balloons, aircraft or stars, and were in fact UFOs of some kind. But that is a long way from saying that the UFOs were indisputable proof of extraterrestrial life. Fulham’s prediction made clear that the October 13 sighting would be the first in a series culminating in an overt intervention by 2015. Perhaps, he was referring to the consequences of later UFO sightings in the series in his Press Release. More information about the series and his predicted extraterrestrial intervention by 2015 is found in his book, Challenges of Change, and on his website. So we are likely to have more predictions from Fulham in the months and years ahead about mass UFO sightings he claims will culminate in an overt extraterrestrial intervention by 2015. At the very least, Fulham has gotten the attention of many who did not give much thought to his October 13 prediction. We will certainly pay closer attention the next time he predicts UFOs appearing in a process that indisputably demonstrates the existence of extraterrestrial life.